GYENNO SPOON The GYENNO Spoon is an intelligent piece of tableware specially designed for patient suffering from hand tremor conditions to help them avoid awkwardness and inconvenience while eating . It can recognize and actively offset hand tremor to provide them an easier and more stable dining solution. Safe materials Easy to use Comfortable Sustainable SUGGESTIONS FOR USE The trembling might be exacerbated with anxiety or nervousness, so please try to relax when you use this device for the first several days. If possible, try to use it by the user himself at the first time in order to make the user relax. In the very beginning, please practice with various gripping gestures that adjust the angles and directions of eating to find a most suitable way. Because users have to learn how to eat all over again, it is suggested that they should spend at least a week to tes t the device in order to adapt to the new dining style. Please use a large and shallow bowl with sufficient space and angles for the use of GYENNO Spoon. Never force the arm holding the product. Try to relax and allow the arm to shake freely and GYENNO Spoon will to do its job. for and soft bib is included. 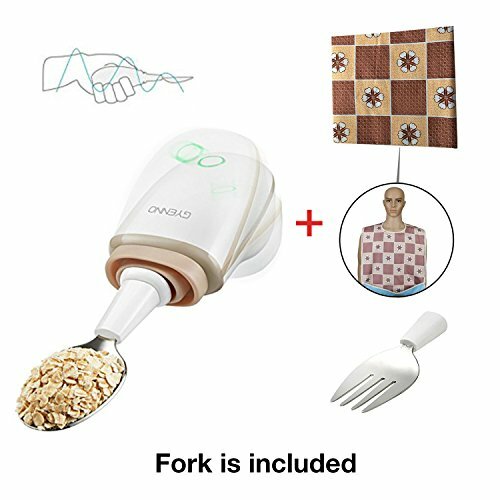 GYENNO steady spoon electronically stabilizes so the attached utensil shakes 85% less than your hand. Worry less about spilling and focus on enjoying your meal. GYENNO portable tableware includes two parts: a stabilizing handle and a utensil attachment. Switch on and off automatically, automatically turn to sleeping mode when you stop using. GYENNO tremor spoon has ergonomic design which adapted to the general hands use habit, total weight 130g, easy to hold and to prevent from slippery. Fully charged battery can run three meals a day （The maximum use of time is 180 minutes). It has replaceable battery designed and the Notification Light shows using/battery status. If you have any questions about this product by GYENNO, contact us by completing and submitting the form below. If you are looking for a specif part number, please include it with your message.